When we were contacted by this Fairbanks Ranch pool owner, they were wanting to have a pool heater repair performed. When we arrived to perform a pool heater diagnostic, we were immediately able to identify a few issues. One was the overall age and condition of the pool heater. The other was that the pool heater was rusting out around the burner try. Due to these first few issues, we let the customer know that performing a pool heater repair may not be the best idea. This is due to the nature of this older pool heater the Purex Triton MiniMax Plus and its existing condition. When we finished showing him the issues and discussing the possible loss of money he was more inclined to replace it. Based on pool heater repairs that may not work at all or not for long, this Fairbanks Ranch swimming pool owner was not interested in worrying that the heater will not work next time he and his wife were wanting to use the spa. He requested that we send him a firm quote for replacing his older broken pool heater with the best pool heater option for his specific application. The pool heater we quoted him for was a Raypak 406A pool heater as this is the best pool heater ever made. 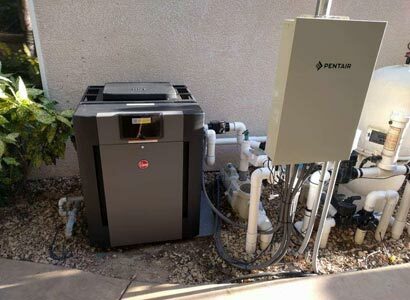 The only time we will not recommend a Raypak, is when the space available will not allow for it and then we would recommend a Pentair MasterTemp. Raypak pool heaters outperform all other pool heaters and they are the only atmospheric pool heater still produced. An atmospheric pool heater means that it does not rely on a fan or blower to remove the heat from the heat chamber. The Raypak pool heater vents naturally which means, there won’t be any costly pool heater repairs pertaining to replacing the blower. Blowers can and do often fail and the cost is fairly high based on the overall cost of a new pool heater. This is why we always go with Raypak whenever possible. We also explain to all of our swimming pool customers that the Raypak pool heater lasts a very long time and they are the most serviceable pool heater made. 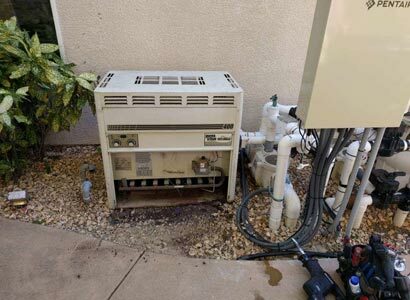 That means if and when this pool heater is in need of repair, the Raypak is more than likely able to be repaired over replaced. This is because the parts are always accessible and that they are a much more durable pool heater. This specific pool heater may last you up to 20 years if kept in good condition and does not get moisture and debris built up around it. If you live in Fairbanks Ranch and are in need of a pool heater replacement or repair, we can help. We work on all makes and models of pool heaters and we also repair all other types of pool equipment. We perform complete pool equipment repairs and new pool equipment installation and upgrades for Fairbanks Ranch and the rest of San Diego County. Feel free to give us a call or fill out our contact form and we will be happy to help you with any of your swimming pool or spa needs.